One of the biggest problems in hospitals today is a lack of communication . This occurs at multiple levels. Patients and family members don’t not understand what the doctor is saying. Doctors are busy people and are often in a rush when they are on their hospital rounds. They breeze in and out of the room, and even before the patient can collect his wits, they have disappeared. Patients and caregivers often do not understand medical jargon and are scared to tell the doctor that they have not understood anything he has said. The doctor is blissfully unaware of this lack of communication, and feels he has done a good job. The communication gap is not only between the patient and doctor – there are gaps between doctor and doctor as well. Typically, many medical specialists are involved in providing care of the patient, and the care often gets fragmented. They are rarely in the room at one time, and this lack of coordination is a huge problem. The right hand does not know what the left hand is doing , and sometimes the information they provide to the patient is different, leading to even more confusion. This is true for nursing care as well. When shift changes, and a new nurse comes on duty, sometimes the hand-off is not done properly, and patient care suffers because of these gaps. Ideally, the written medical record is meant to ensure that the care is properly coordinated, but this doesn’t always work well. They become voluminous, which means it’s easy to miss critically important information. Also, patients don’t have easy access to their records, which means they are often in the dark as to what’s going on. This lack of communication is one of the major preventable reasons why medical errors occur. The problem is compounded when the the patient’s family members are not on the same page, which means that they end up talking to the doctor at different times, thus wasting his time and irritating him. Often, they may disagree with each other and this makes matters worse, because they express conflicting wishes as to what they want done for their patient - often behind each other's backs. In a perfect world, we would be able to get everyone together in the room at the same time, but this is not possible in reality. Here’s a simple, low-cost solution, which could be implemented easily in all hospital rooms today. Every hospital room should have a whiteboard, on which everyone is free to write and comment. The whiteboard would come equipped with markers of different colours and could be used for multiple different purposes. The doctor could use it to explain to the patient what is wrong with them and how he plans to fix it. An image is worth a thousand words, and this could help to overcome lots of misunderstandings. Ready made anatomical medical magnetic stick ons could be used for doctors who are artistically challenged.! The doctor could write down the proposed treatment plan; and the other medical specialists and nurses could modify and edit this. For example, there could be a daily list of medications which need to be given, along with the time they are meant to be administered. Once the medicine is given, it could be struck off the list. In case there is a delay, the family member could gently remind the nursing staff about this oversight. Checklists could be easily incorporated on the board. This is especially valuable before a planned operation , for example; or at the time of discharge, when there are multiple moving parts which need to be synchronized to ensure that they work properly. Patients could write down their concerns, so that the doctor can address them on his rounds. This ensures that they don’t forget to ask a critical question; and this way they don’t need to bother the doctor by pestering him queries on his mobile. This board Would help to make the patient better organized as well ! Warnings ( for example, allergies) could be highlighted on the board, so that everyone is aware of them. Patients often forget the instructions which doctors and nurses and therapists give them. These could be written down on the board, as a list of Dos and don’ts, to make sure they are remembered correctly. A section of the board would be reserved for the patient and the family members. Here they could write down their story ( of what happened, for example) and what help they need, so they could share this with friends and loved ones. More importantly , they could write down their doubts and concerns. Not only will this help to make patients feel empowered, the hospital staff would get a chance to hear the patient’s voice directly. This would prevent problems from escalating, and help to improve patient satisfaction. The board is environmentally friendly, as it can be reused daily. If a long term record is needed, patients could take photos of the board, and share them as needed. 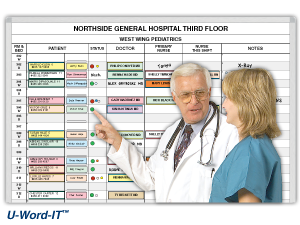 A whiteboard is be a very simple tool to get everyone on the same page, and every hospital room should have one ! Bleeding during pregnancy - is my baby fine ? Early pregnancy scans- is my baby fine ? Is my IVF pregnancy healthy ?